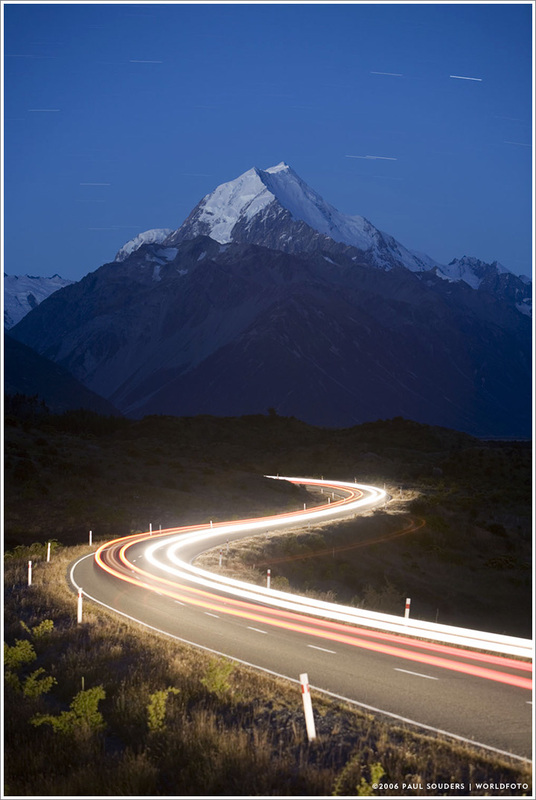 Car headlights driving on two-lane highway under glacier-covered summit of Mount Cook at nightfall. Photographed January 28, 2006 with a Canon EOS-5D camera and 24mm f/3.5 Tilt-Shift Lens. Exposure 5 seconds at f/11. This entry was posted on Saturday, January 28th, 2006 at 7:30 am. It is filed under On the Road and tagged with Landscapes, Mount Cook, New Zealand, Oceania, Road Scenes. You can follow any responses to this entry through the RSS 2.0 feed.